What would YOU do to save your family? What lengths would you go through to rescue your loved ones from a truly horrible fate? A fate such as being eaten by a pack of giant spiders? This is the question that “Bite Me Spider” asks. A bona fide page-turner, “Bite Me Spider” combines an outrageous disaster scenario with intense family drama. James Dresden wants the best for his family, including his daughter, Carol, his wife, Hannah, and their unborn child. When Hannah is diagnosed with cancer, the family opts for a radical new treatment, the bite of the genetically modified Black Hermit Spider. Although Hannah is cured there is a terrible cost: an invasion of giant spiders that threatens every living thing on the planet. To save his family, James must face the scuttling menace head on. He must perform deeds that would put weaker men in the madhouse. Buckle up, horror fans. 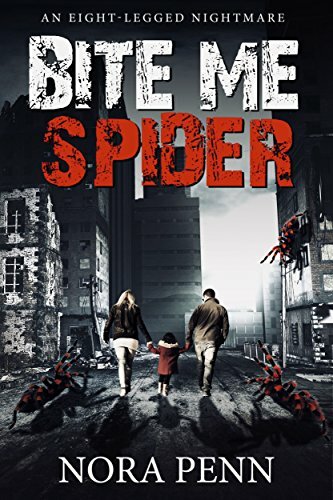 “Bite Me Spider” puts YOU, the reader, in the driver’s seat, allowing you to experience the terror, the tension, the madness, the mayhem, and the tiny moments of salvation, that are part and parcel of surviving in a world overrun by spiders. The question remains. If all hell broke loose, what would you do to save your family? Read “Bite Me Spider” and find out.